Halve and peel squash. Remove seeds and cut the squash into 1 inch chunks. Heat oil in a Dutch oven over medium heat. Add onion and cook for 5 minutes. Add garlic, cayenne, cinnamon, nutmeg, and ½ tsp cumin and cook for 1 min. Stir in squash, tomatoes, raisins, broth, chickpeas, and 1 ½ tsp of salt. Bring to a boil. Reduce heat, cover, and simmer 10 min. Uncover and cook until squash is tender, 15-20 min. Meanwhile, in a medium saucepan, bring 1 ½ cups water and remaining cumin and salt to a boil. Stir in couscous. Cover, remove from heat, and let stand for 5-10 min. Fluff with fork. Serve squash mixture over the top of couscous. Sprinkle with parsley and almonds. This recipe is another favorite. I really enjoyed this one, and my daughter even ate it! It was tasty, sweet, and satisfying. Place couscous in a bowl. Add 1 1/2 cups boiling water and stir. Cover tightly and let stand 10 minutes. Meanwhile, in a large skillet, over low heat, toast pine nuts, shaking pan frequently, until golden, 3 to 4 minutes. Transfer to a plate. Return the skillet to medium heat, add oil, and heat for 1 minute. Add garlic and cook 1 minute. Add chickpeas, raisins, chard, salt, and pepper. Cook, stirring occasionally, until chard is tender, about 5 min. Remove from heat. 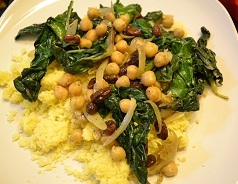 Fluff the couscous with a fork and divide among individual plates. Top with chard and sprinkle with pine nuts. This was a very delicious recipe! I will definitely be making this one again and again. I love the extra flavor the raisins add. I had never had chard before, but it is also very tasty. The only thing I will mention is the couscous–don’t forget about it like I did. Pay attention to how long you let it sit. I got caught up in the cooking of the veggies, that I let the couscous stand too long and it got clumpy and kind of hard. Besides not adding pine nuts, I did add onions for extra flavor that way as well. Yummy! Sometimes the days are just too busy to try a new vegetarian recipe. What I have come to realize is that cooking vegan or vegetarian is really actually quite easy. I have gotten into a routine of always having enough food to choose from each and every day which, in the end, is less work for me daily. I cook quite a bit on the weekends and just maybe once during the week. This is an easy and quick veggie stir fry recipe that can be made and eaten with some rice and beans any day of the week. You can really use any veggies you can think of in a veggie stir fry. Put all the ingredients in about 2 tbsp of olive oil in a large pan with seasoning. At first it seems as though all of this won’t fit in the pan, but it cooks down rather quickly. I stir fry it for about 5-10 min, turning occasionally. 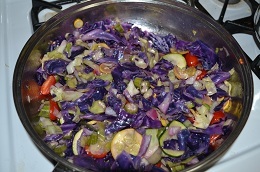 Then I cover and cook on a lower temperature until all the veggies are tender, about 20-30 min. I serve with jasmine rice and kidney beans cooked in coconut milk. Yummy! And you don’t feel guilty after eating it, no matter how much you eat!